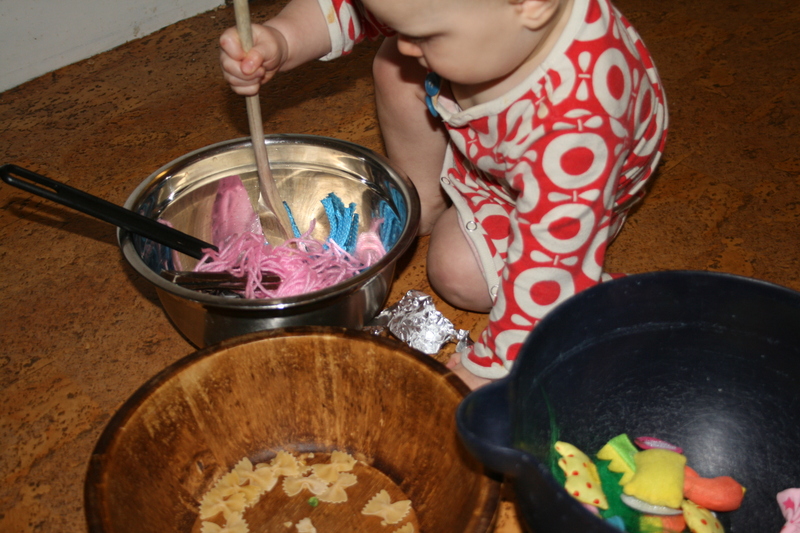 And one year olds are busy too! 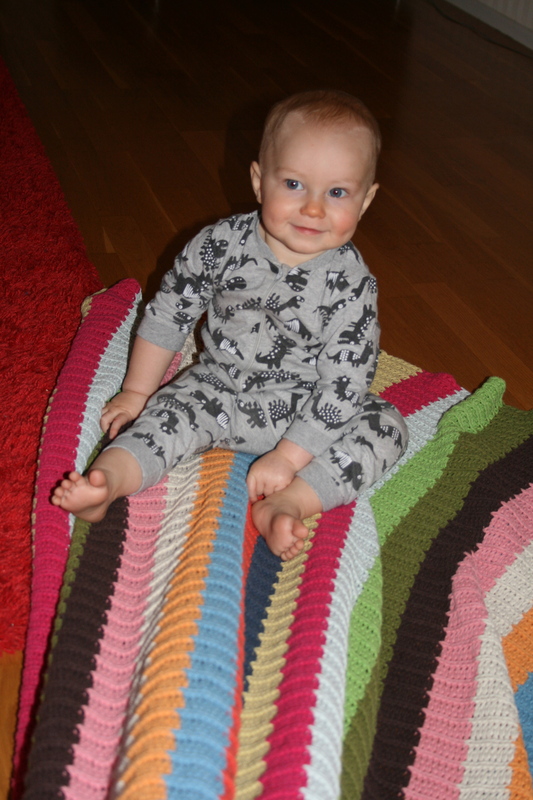 He loves to sit on a blanket while you pull him around – keeping this sense of balance is so exciting…! 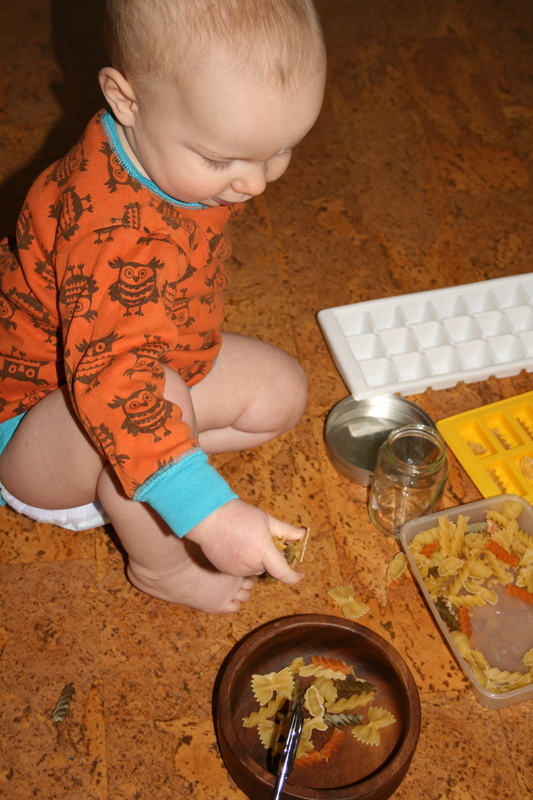 One of his favorite activities is putting small items in to holes. 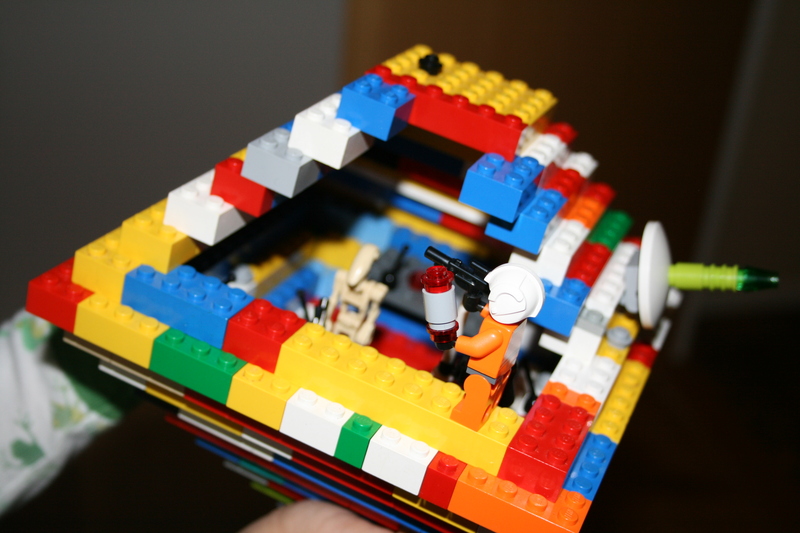 Simple sorting boxes are fun! 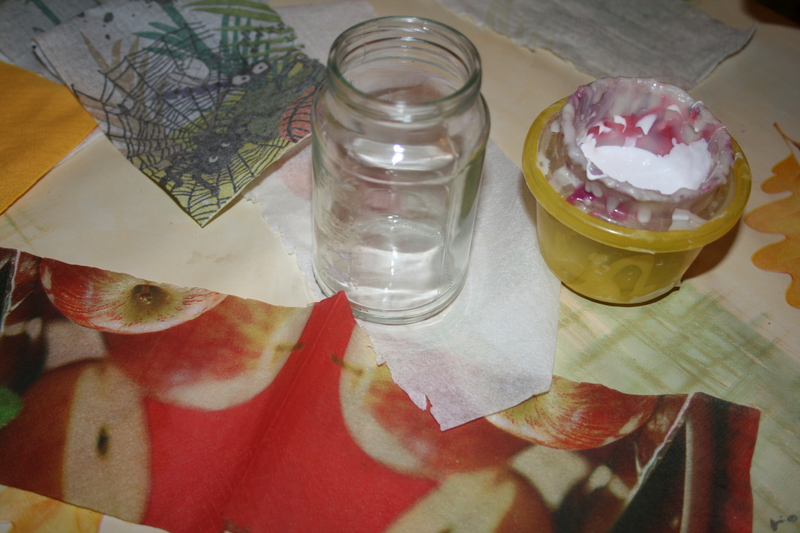 And to mix cotton wool balls, pieces of tin foil, material pieces and dried pasta in bowls made of wood, plastic and metal – and spoons made of the same. 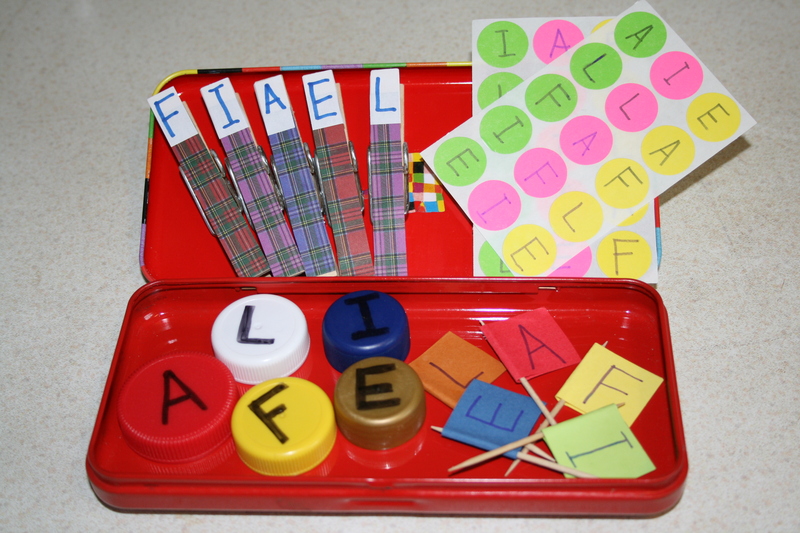 This was a big hit -all those different sounds and textures …! 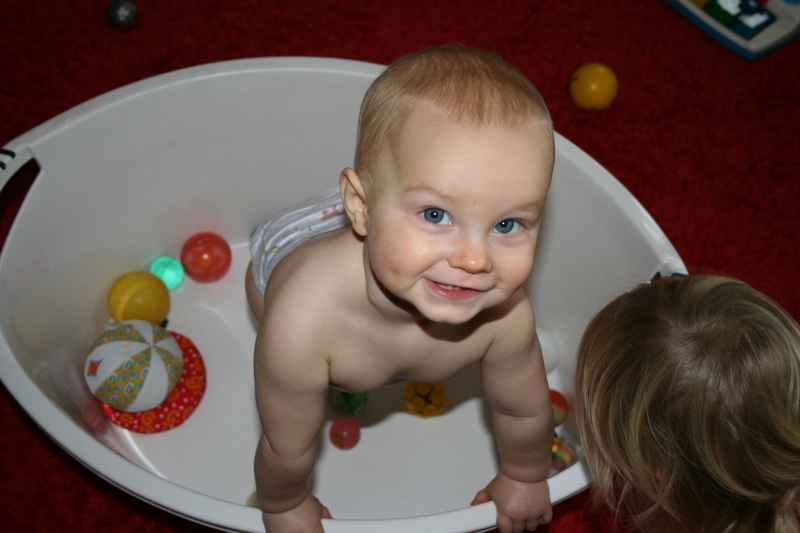 And if all else fails – just pop him in to a laundry tub with some balls…! 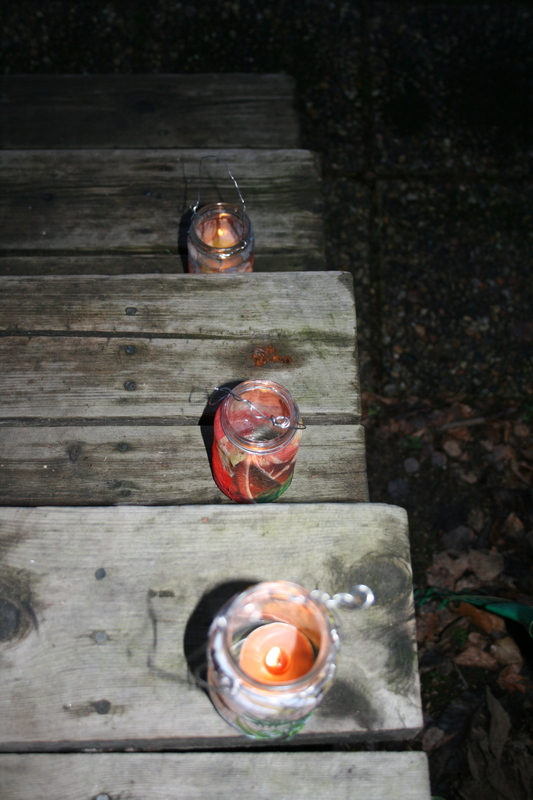 Brighten these darkened December days and welcome your friends with a lantern! 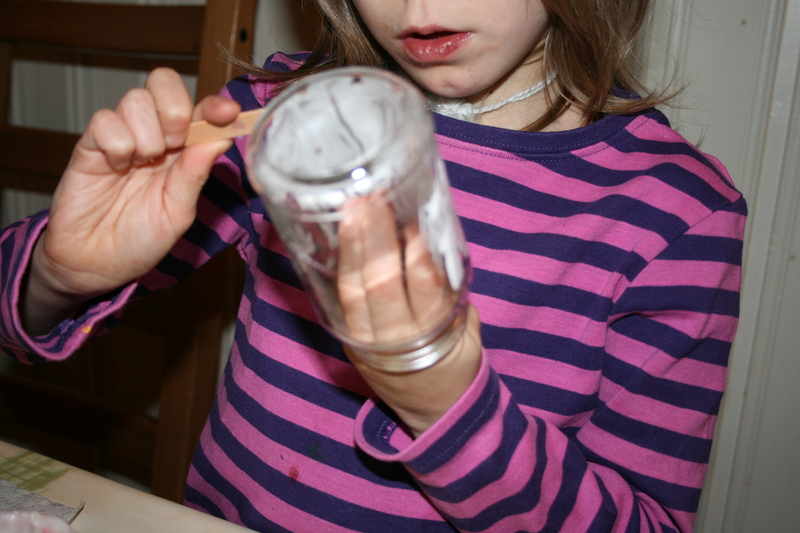 Add wire around the top and in to a handle…. Perhaps it’s because he’s a Leo and born in July? Or perhaps it’s just the way he is? But quietly, in a determined fashion, he is most definitely a leader. 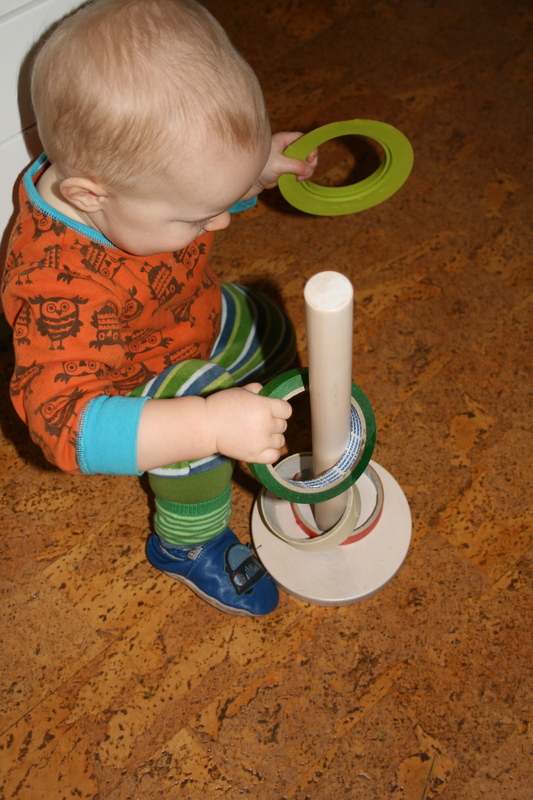 He is filled to the brim with new and creative ideas…. 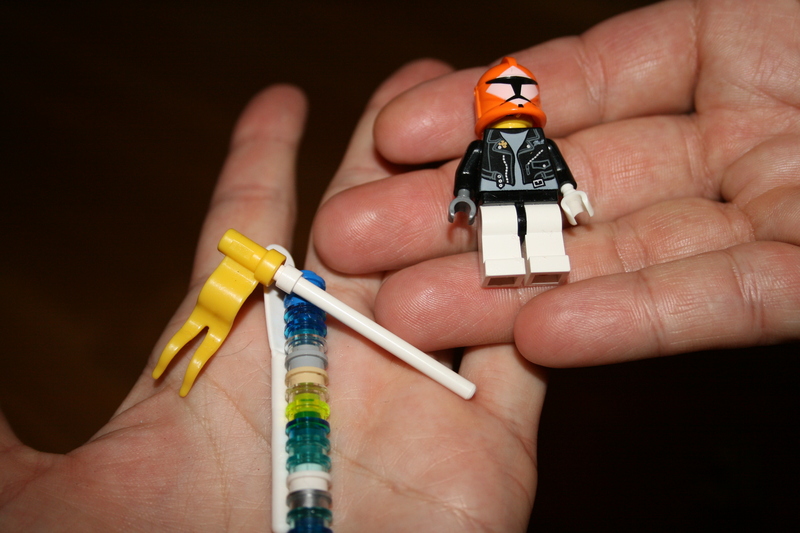 Often my kids make homemade gifts. 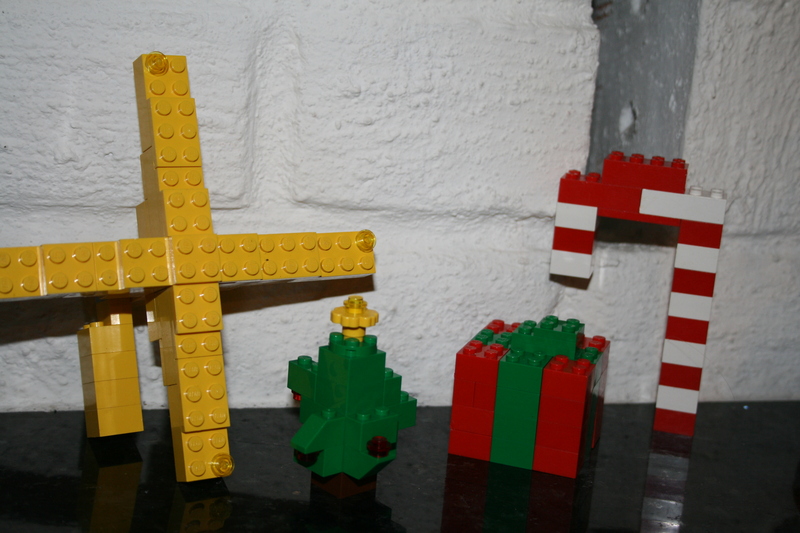 From left to right – a star, a Christmas tree, a present and a candy cane. I love them. And they’re perfect for the mantel piece. Now this folks, is the Star Wars ‘Death Star’! Let’s try to show you this one again…. 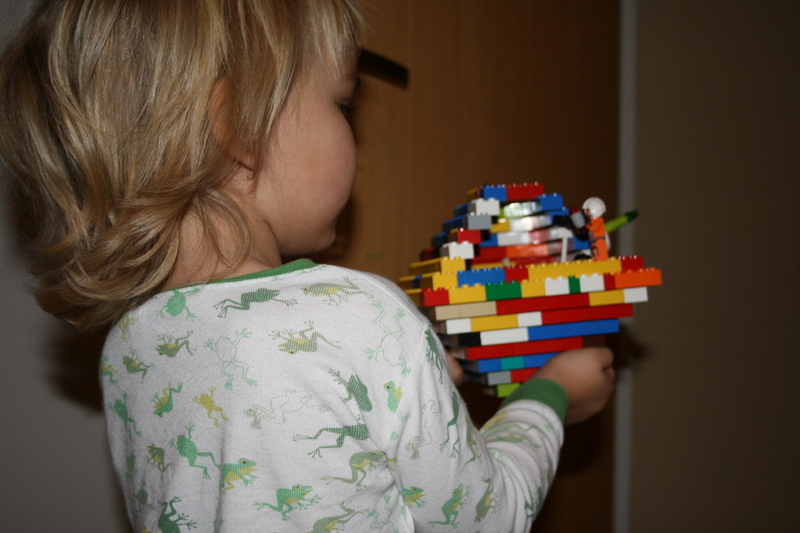 Mummy wasn’t allowed to get near it – in case I broke it…..! However, can you see that construction?!!! So, as I say, Leon is a leader. 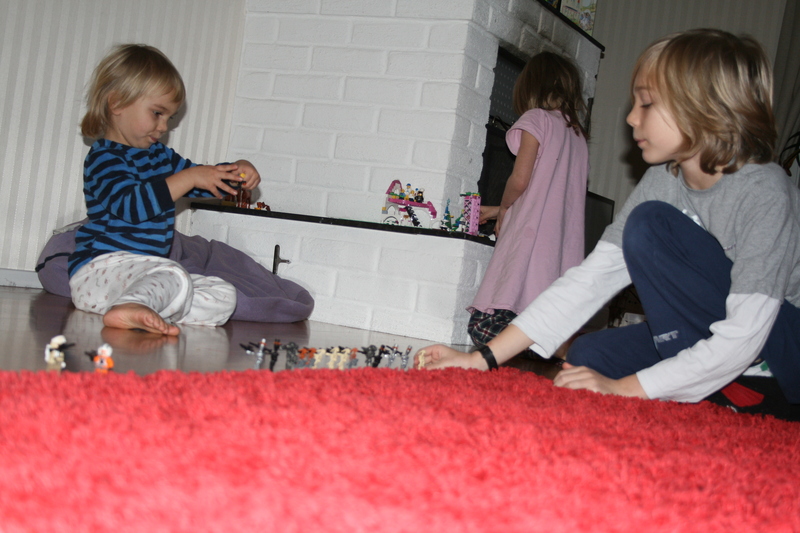 Even Alfie got involved with the lego gifts, spending some hours wrapping and labelling the gifts all by himself…. 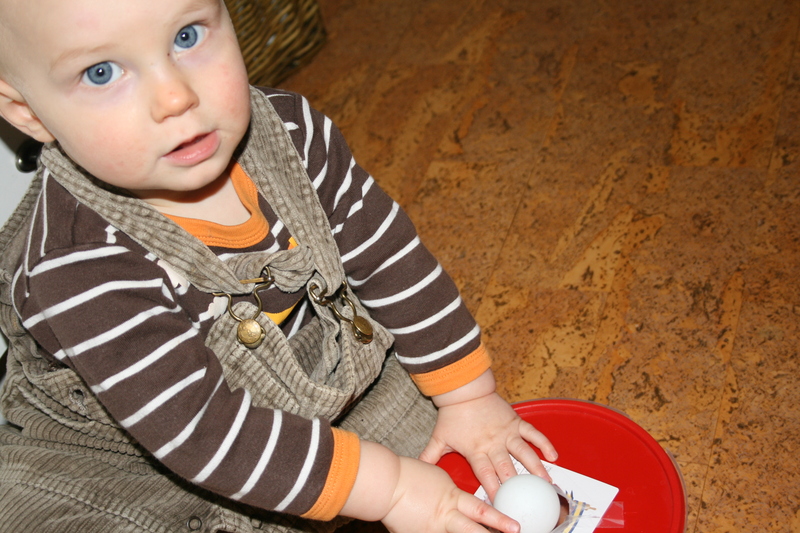 It’s the giving that’s important – right? 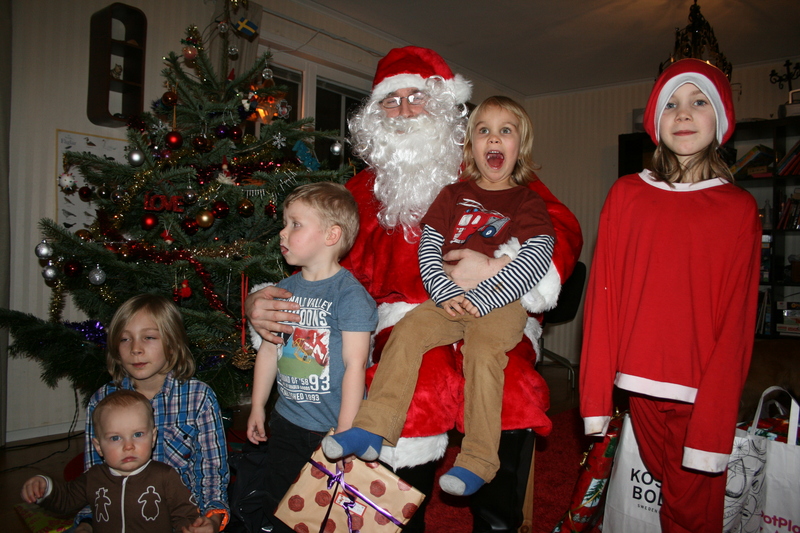 Happy Christmas – Or ‘God Jul’! 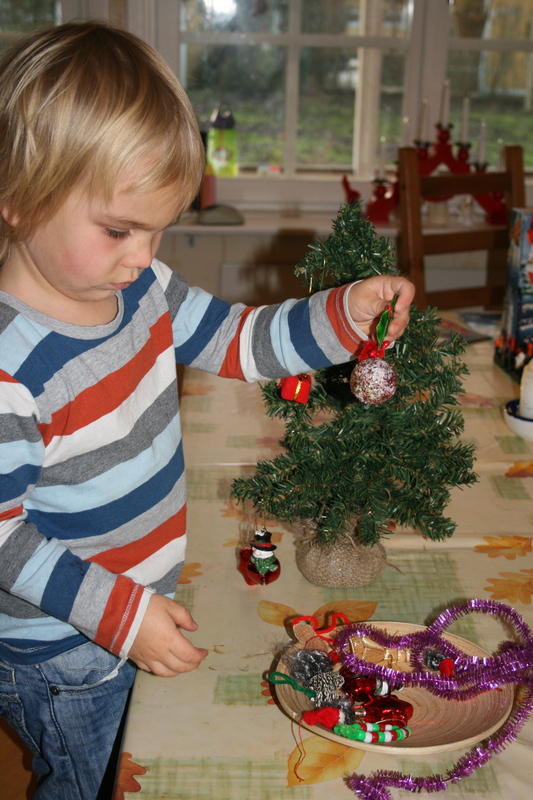 In Sweden the big Christmas celebrations are not on Christmas day, but on Christmas Eve – ‘Jul Afton’. The day generally starts with the watching of ‘Kalle Anke’ – a combination of short excerpts of the classic Disney films – with a festive twist. Course 1 : Pickled herring, boiled potatoes, boiled egg halves with caviar, salmon pate, christmas ham and christmas bread. Course 2 : Meatballs, small chipolata sausages, boiled potatoes, red cabbage and apple salad. Course 3 : Creamy porridge with cinnamon – one almond is hidden in the pot – if you get the almond you shall marry within the year! 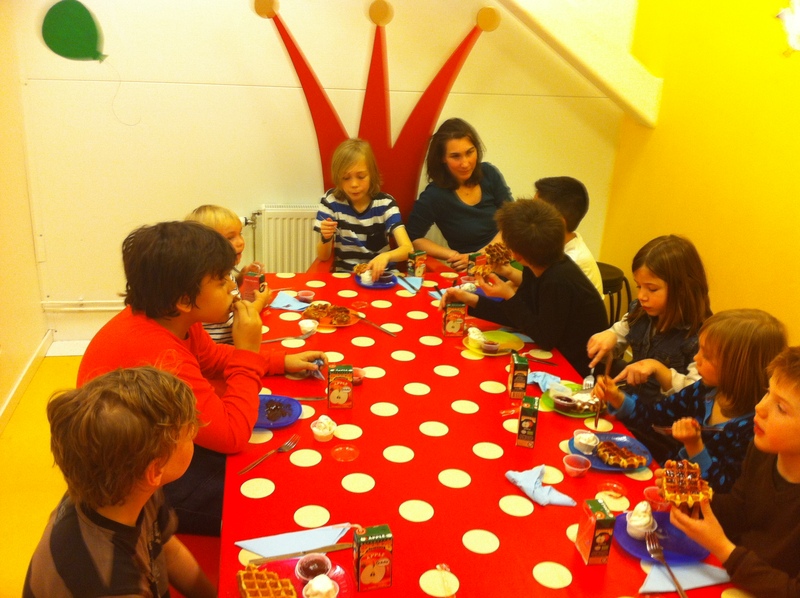 Course 4 : Glögg (a mulled wine) and christmas sweets (such as ischoklad and knäck). 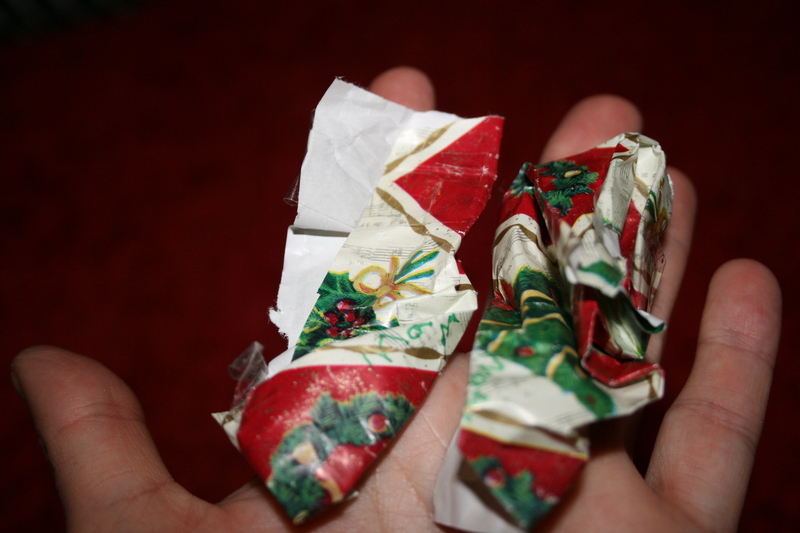 For Father Christmas – or ‘Tomten’, of course! Eventually, all dressed up. he trudges through the darkness, often through the snow. It’s a magical experience to see this magical man in his bright red suit wandering down the lane with a sack on his back! The kids are filled with both excitement and fear. 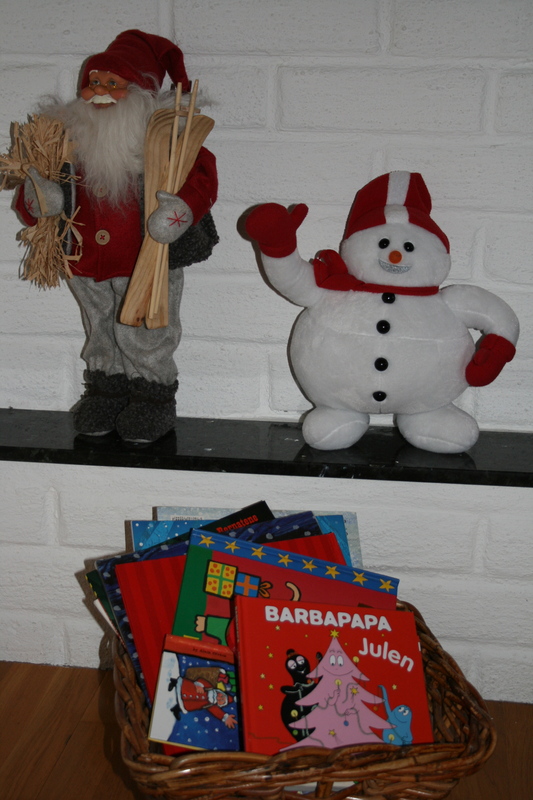 Happy Christmas & God Jul to all! 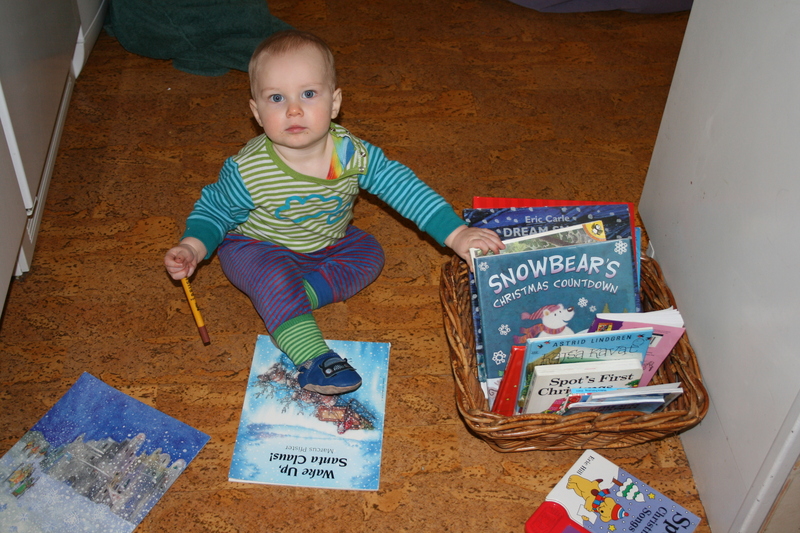 It’s nice to have a basket of books for the kids in the living room. Something they can dip in to. 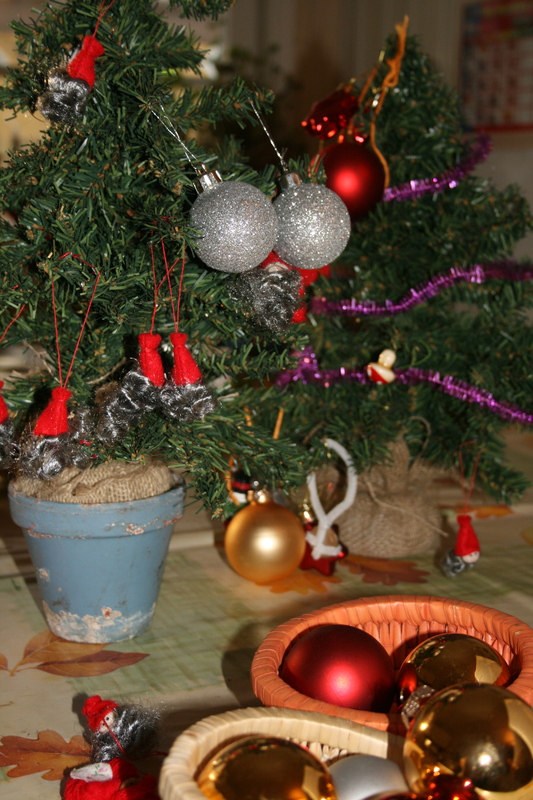 Often based on a seasonal theme. And sometimes it’s fun to use our knowledge of other stories, to make up our own. 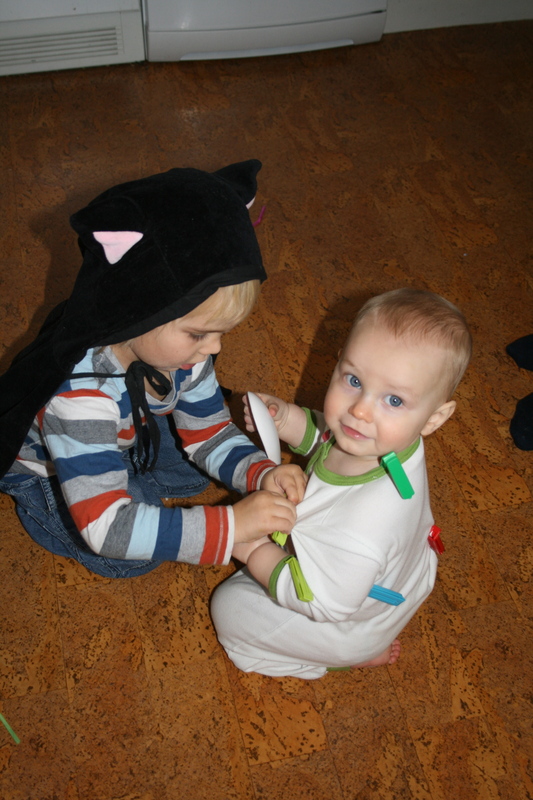 So every evening, just before story time, Alfie and I have been making up, and telling, the continuing story of…. 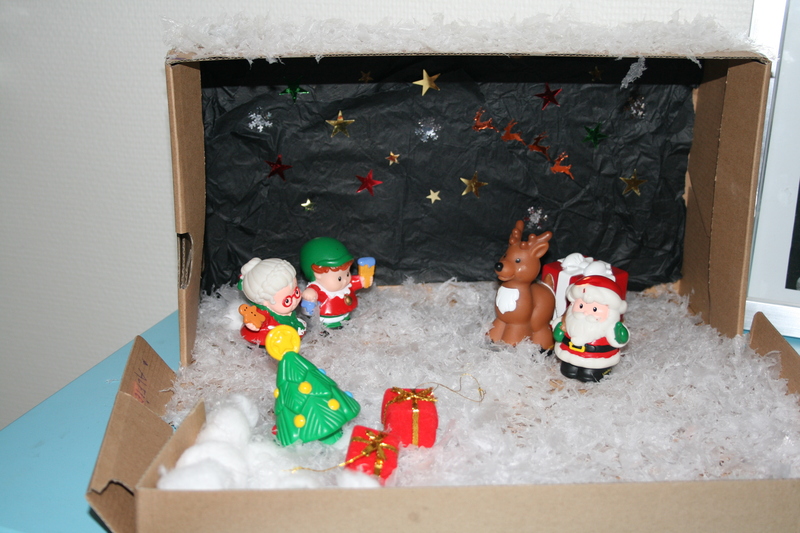 Having found a Christmas tree and presents in the middle of the snowy forest, the little elf wondered where they came from? 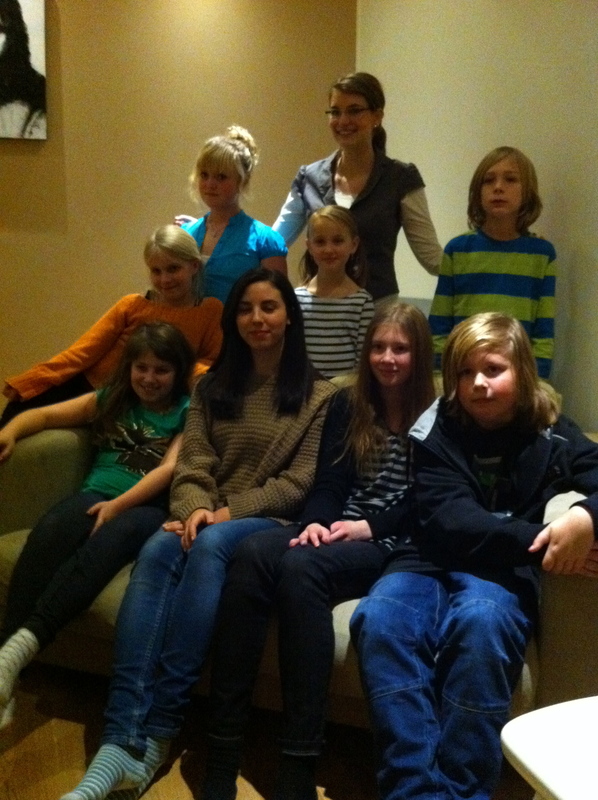 Tonight is the last piece of the story…. what will happen I wonder….? Ooooh! 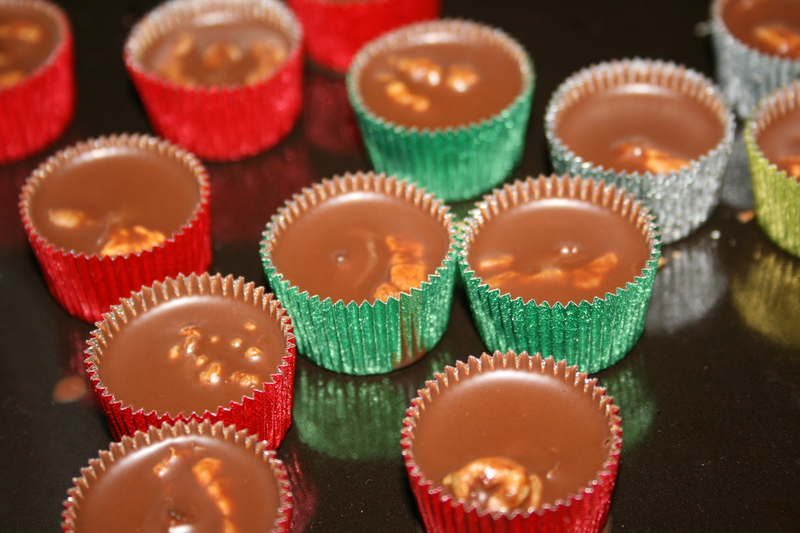 Just a quick recipe for the most delicious ‘sweet’ ever! In English it’s translated as ‘Ice-chocolate’. Is that because it melts in your mouth? This sweet is part of the traditional Swedish ‘julbord’ (Christmas table), and is very easy to make. Step 1 : Melt the coconut fat and the chocolate together. Step 2 : Mix and pour in to sweet cases. Step 3 : Leave to cool. Keep in fridge. We also put a hazelnut in each for extra ‘crunch’! Apparently, according to my husband, these are a very Swedish Christmas tree decoration. 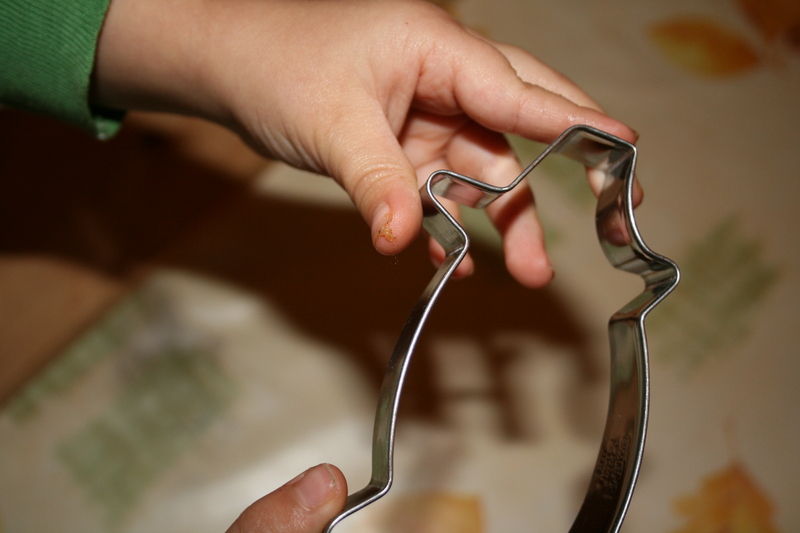 So I’m going to attempt to show you how to make them…! Step 1: Wind the first piece of wool around the card 22 times (this will be the body). 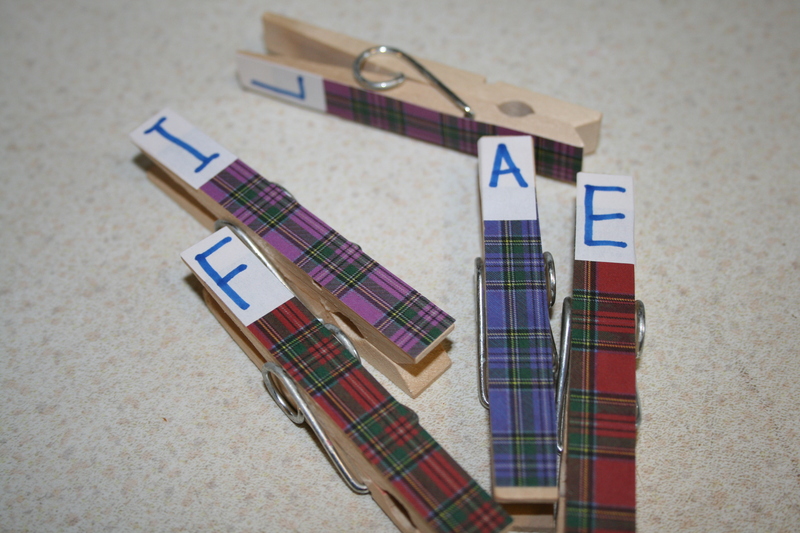 Cut wool, tie the two end pieces together, and carefully take off card. Leave exactly as it came off the card so there is a circular gap. Step 2 : Repeat this again with the other colour of wool, just winding around the card 14 times. This will be the arms. 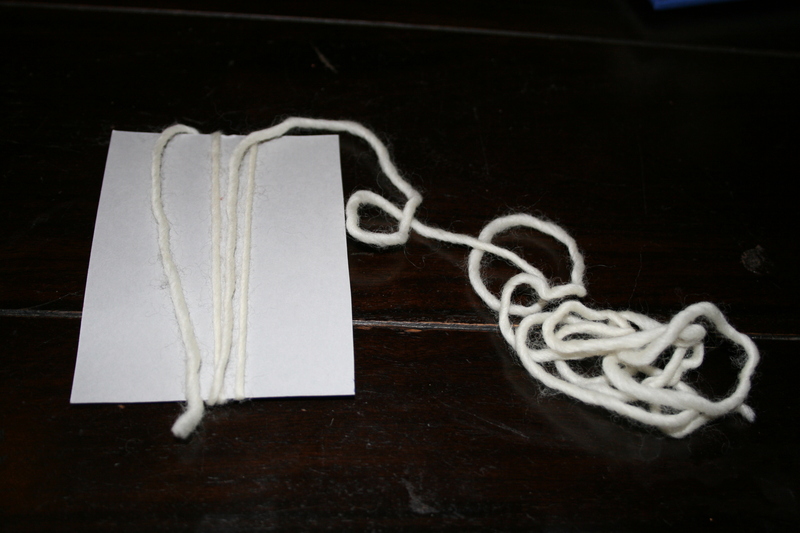 Step 3 : Using a separate piece of wool,tie the arms at both ends to make hands (see below). Step 4 : Put the arm wool through the gap in the body wool (see below). Step 5 : Tie a separate piece of wool around the ‘waist’ like a belt, to keep the wool in one place (see below). Step 6 : If you want to make a boy, separate the wool under the belt in to two bits, and tie with seperate pieces of wool at each end to make legs. If you want to make a girl, simply trim the wool at the bottom to make a skirt frill (see below). Step 7 : Take a piece of wool (around 15 cm) and thread in under the top of the body wool, just by the shoulders. Tie at the top where the head would be. 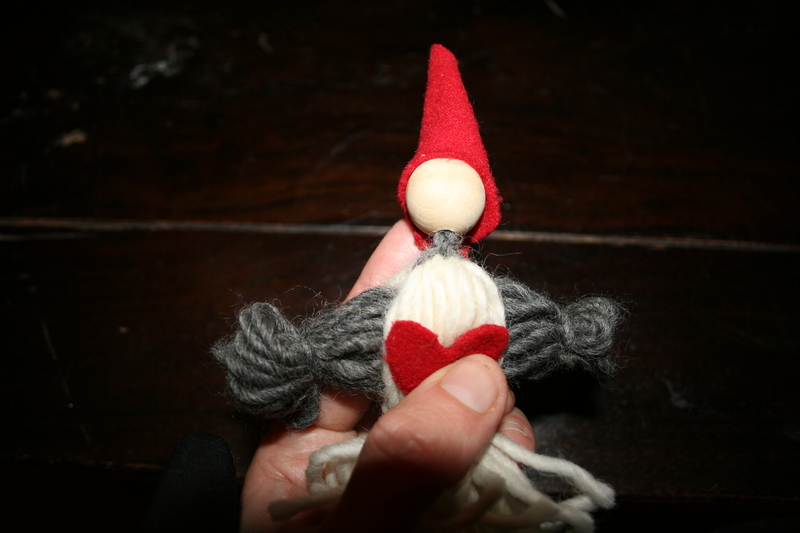 Step 8 : Thread the ends of the above wool through the wooden bead for the head. Knot at top (see below). 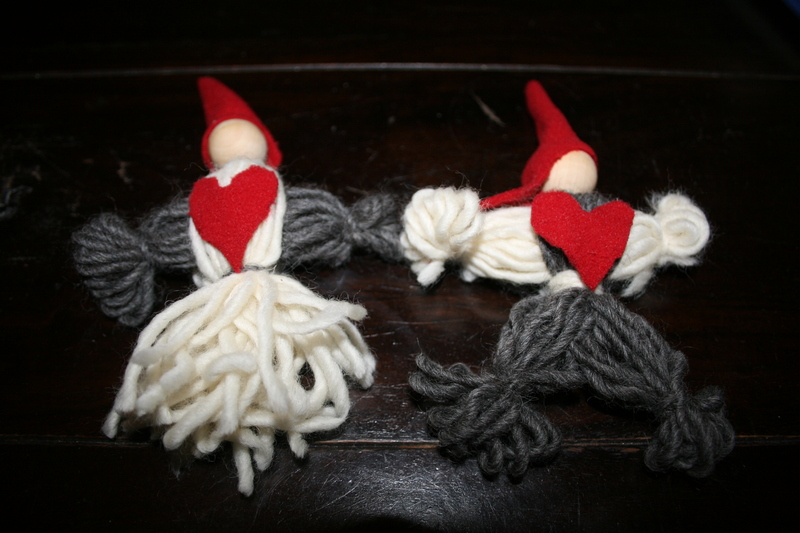 The ends of the wool can be trimmed, or made in to the pixie’s hair, as you like. 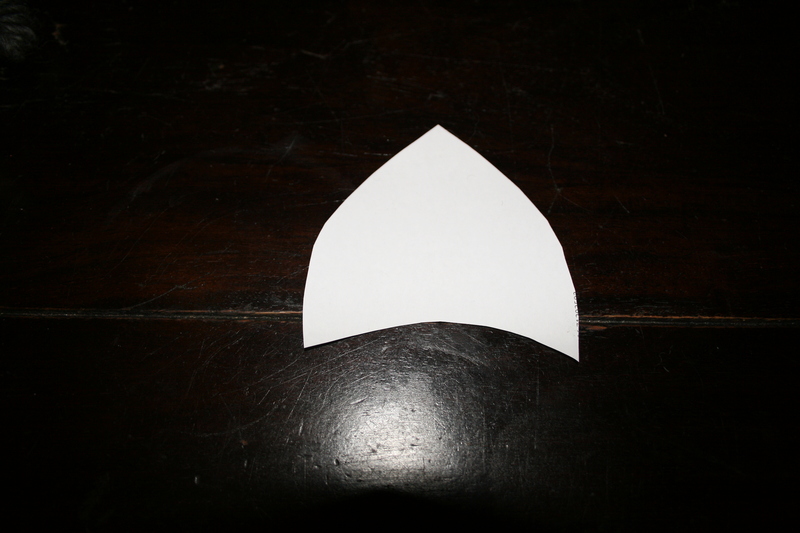 Step 9 : Next cut a piece of felt in to a ‘pointed semi circle’ shape (see paper example below). Step 10 : Curve felt hat around head, placing a little glue on to inside of felt and back of the wooden bead ‘head’. 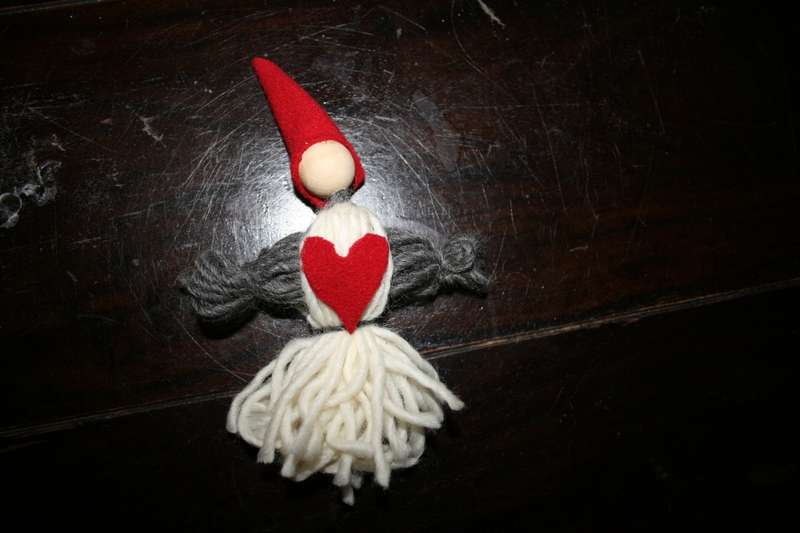 Cut heart shapes, or similar, from felt, and accessorize, using glue, if wished. 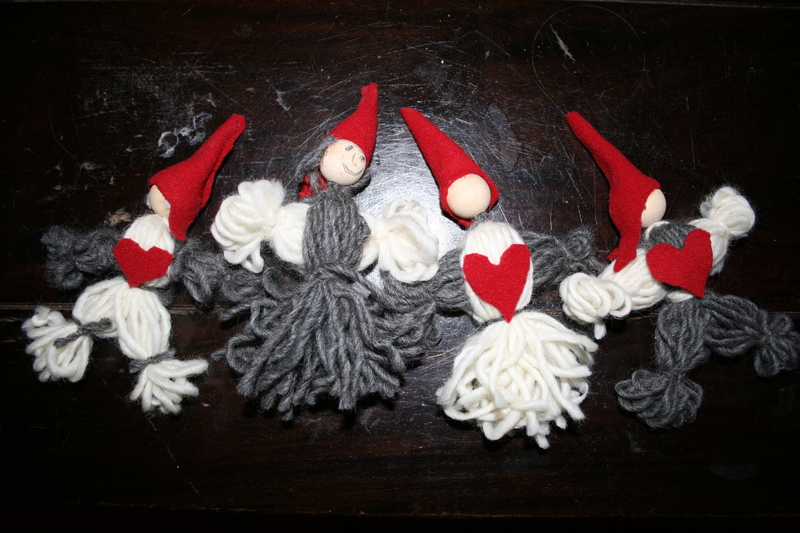 I’m going to sew a red thread on to their heads so they can be hung on the tree. 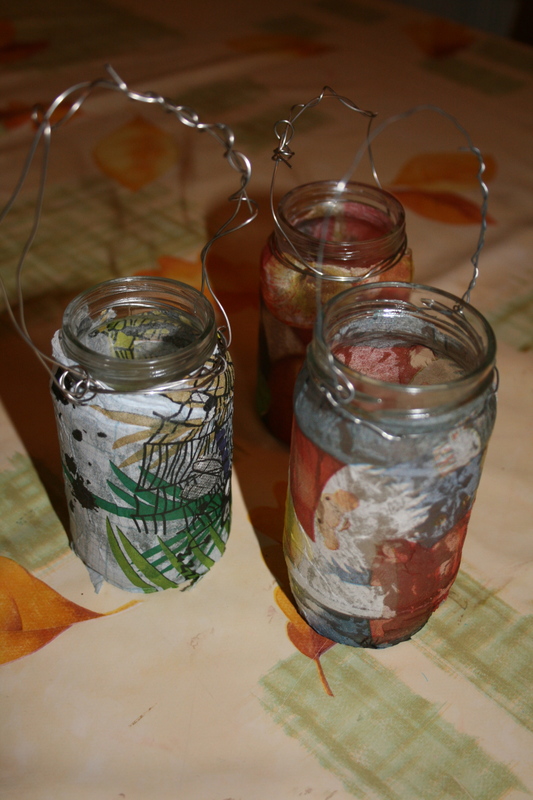 Leon and Maya both found these relatively easy to make – a great little Christmas present for their grandmother! 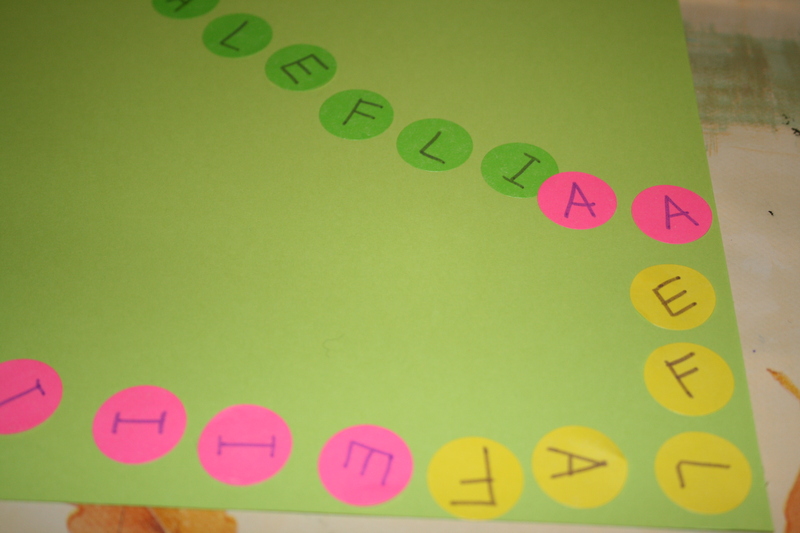 How Do I Write ‘Alfie’? 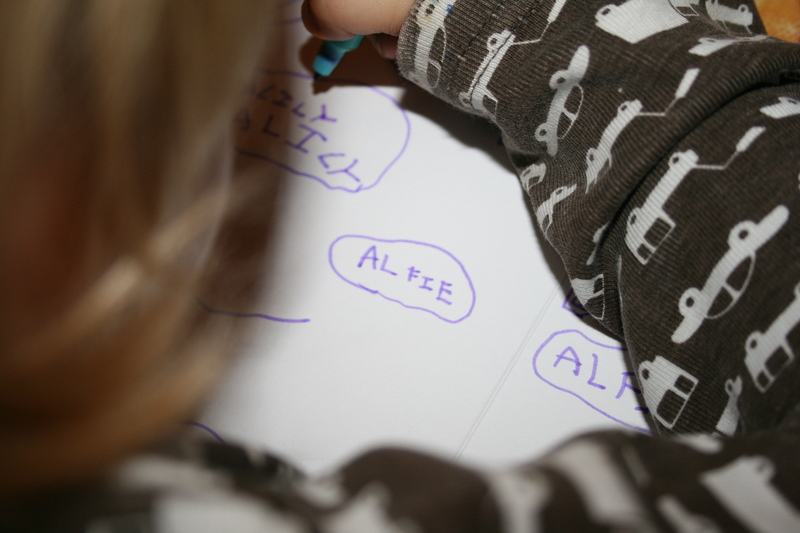 Lately Alfie has taken a great interest in writing his name. 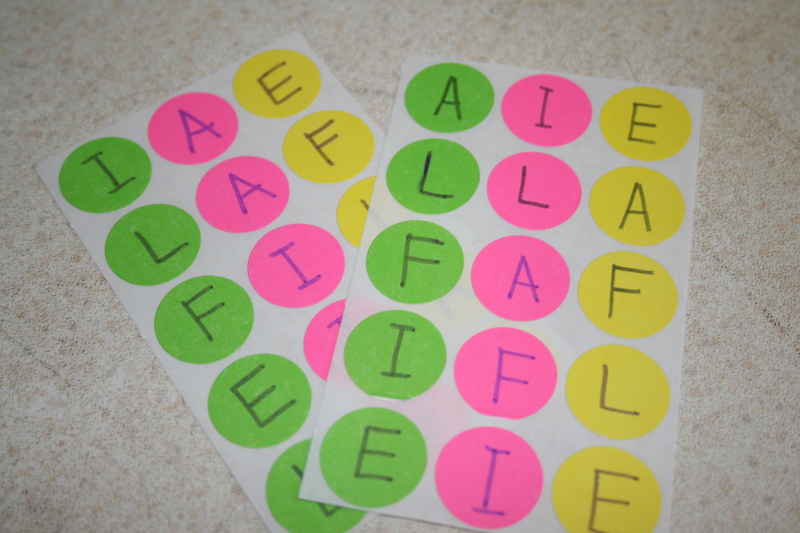 “How do I write Alfie?” he asks on a daily basis. 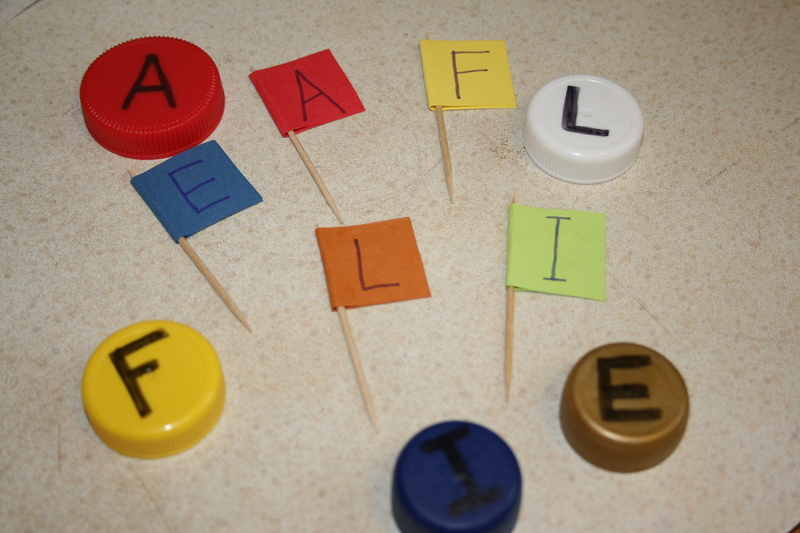 He knows the letters – but isn’t too sure of the order in which they go in. So every day, whenever he asks, we lean over him and tell him. I really wanted a way in which he could easily work it out for himself…. 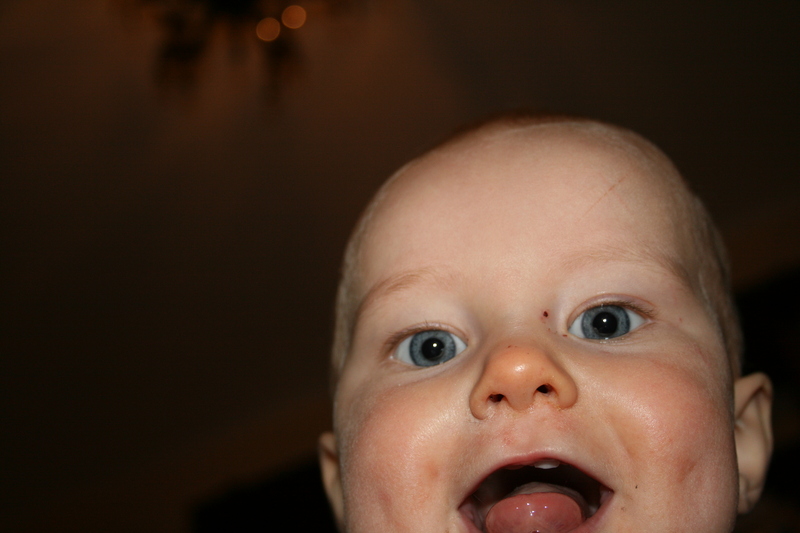 ….and then I discovered this. At first things don’t always work out the way you think things will…. But it always come together in the end….! So Very Busy This Yuletide! Is it really only a few days until Christmas? 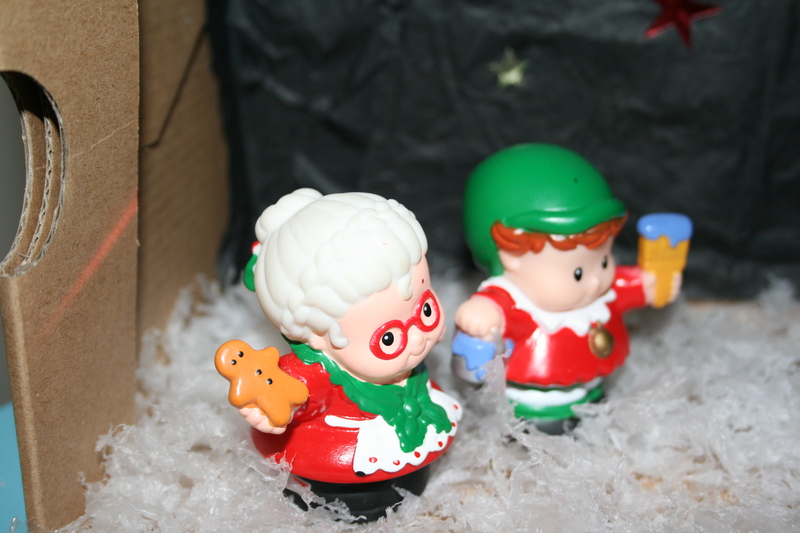 We have been so busy, busy, busy this Yuletide…! 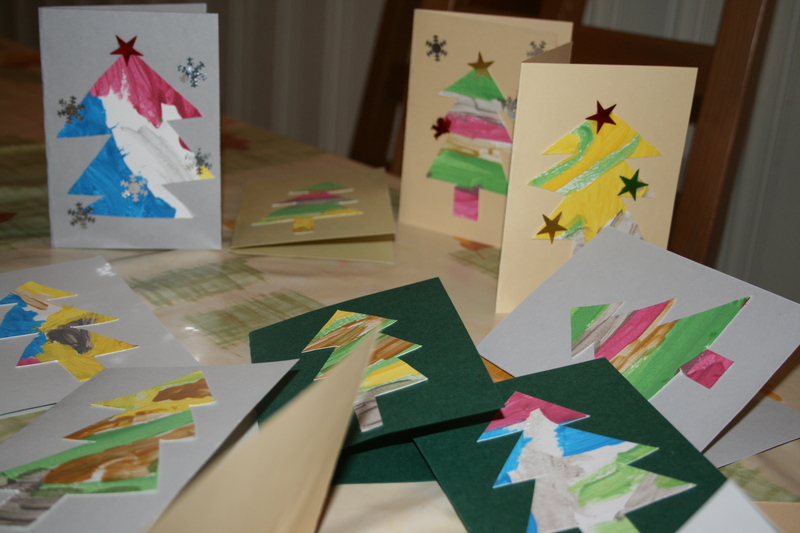 Painted, cut out Christmas trees with sequins for this years cards. 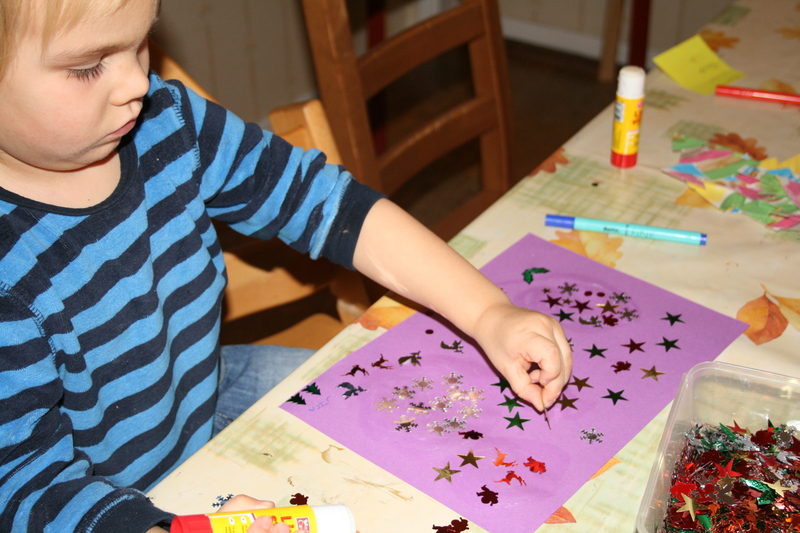 Alfie enjoys making a Christmas sequin picture for his best friend Lilly. 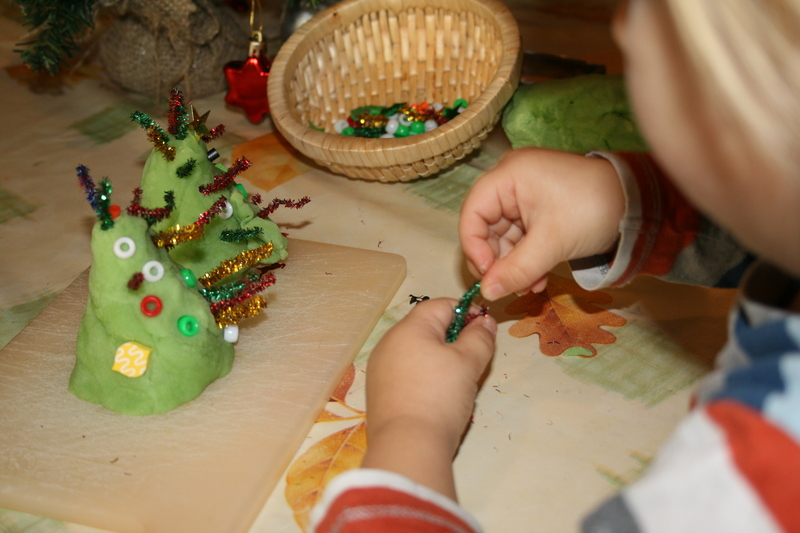 Play dough Christmas trees decorated with glittery pipe cleaners, beads and sequins. Red, green and white coloured paper chains for a welcome in our hallway. 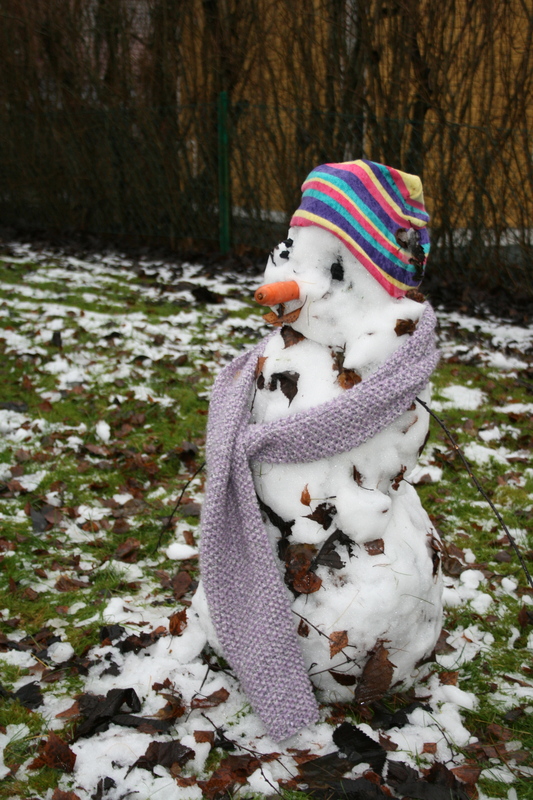 A wonderful snowman, built from the little snow that fell. 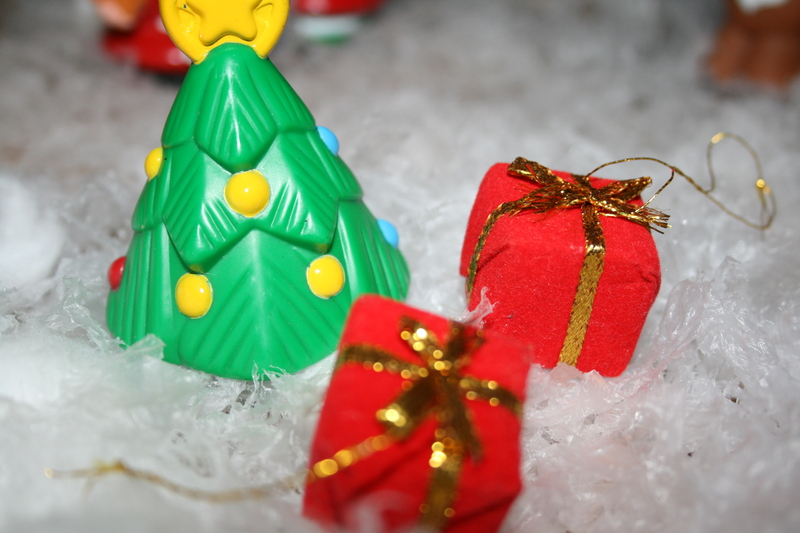 Tiny little Christmas trees for the children’s rooms. 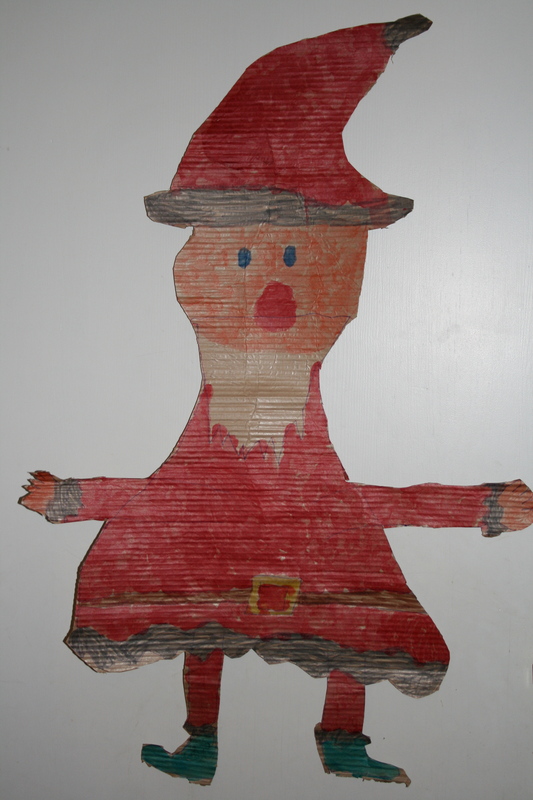 A great big painted Father Christmas for the back of the front door. 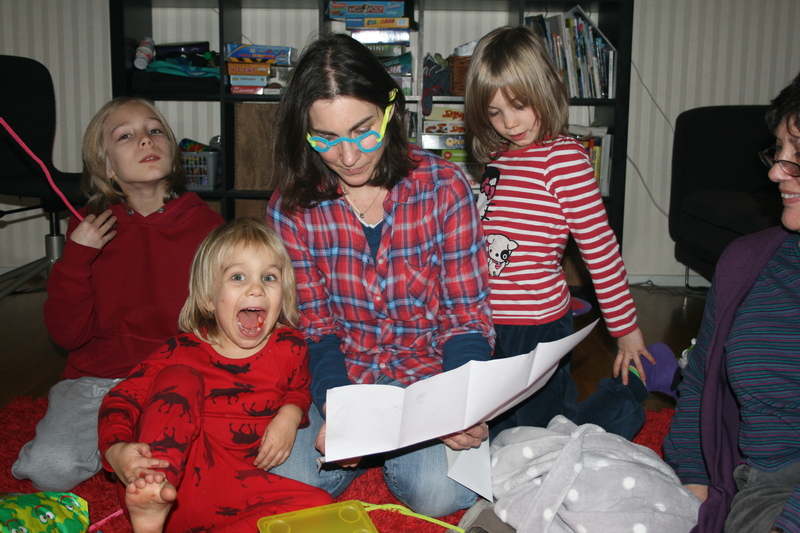 Mummy’s birthday – pipe cleaner glasses optional. 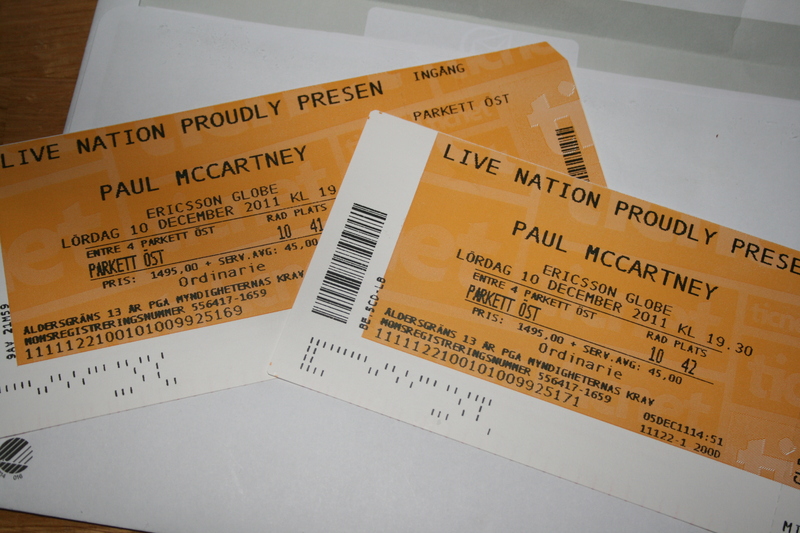 Tickets to see – ( do I believe it?) – Paul McCartney. A belated (let’s say six months) birthday party for Leon, at the play place of his choice. 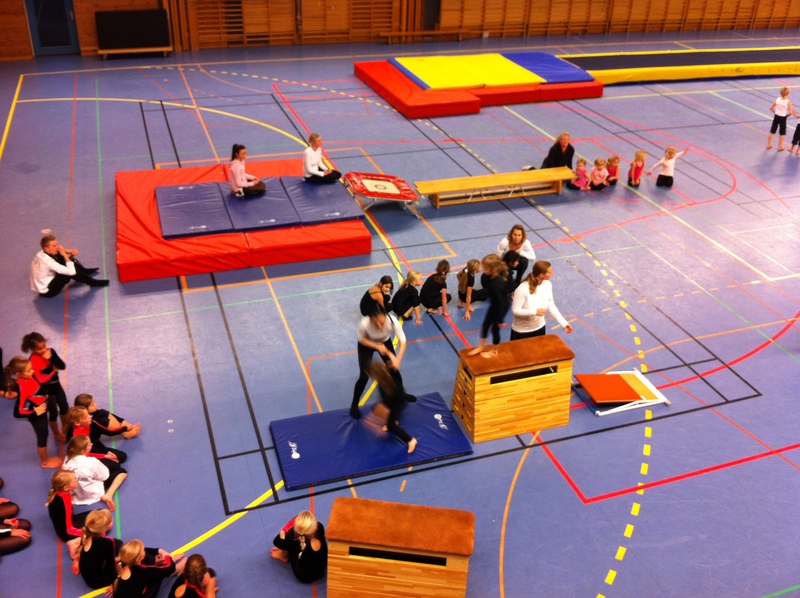 An excellent performance by Maya and her gymnastics club. A wonderful piano concert by Leon and Anna’s other music students. 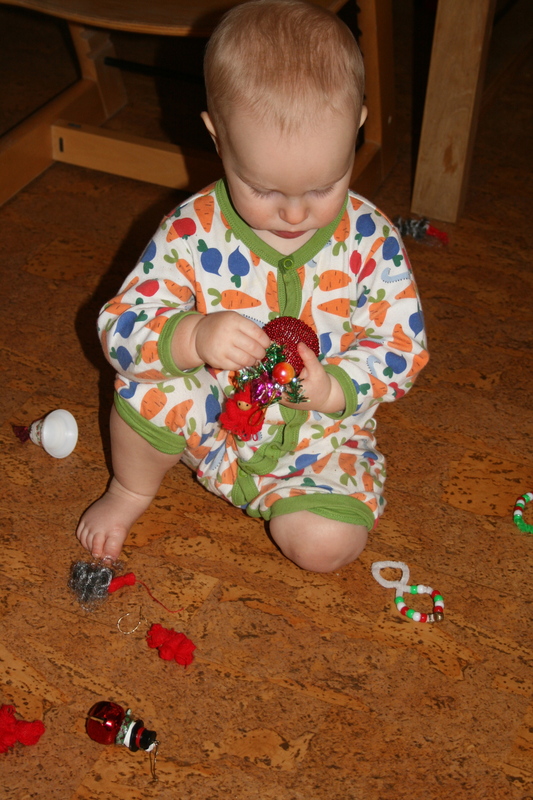 Alfie discovers that plastic bag clips are easy to clip on to Ted’s clothing – and he doesn’t mind. 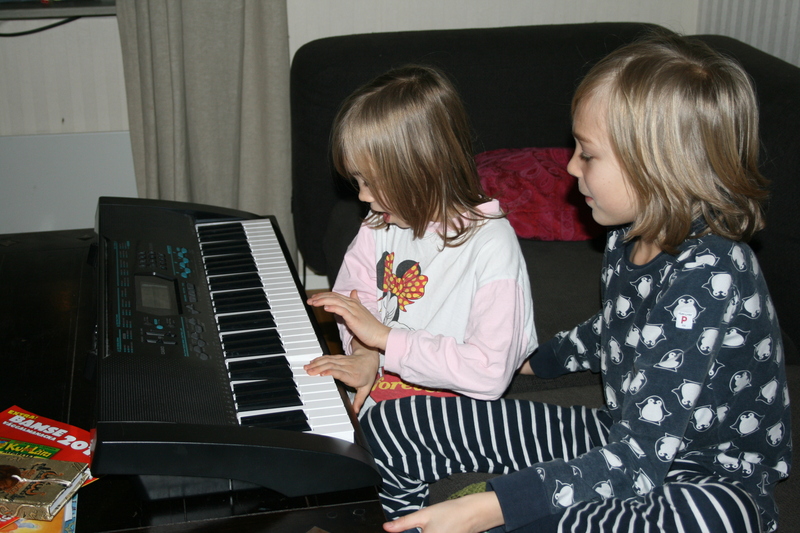 Leon decides to start teaching Maya how to play the piano. 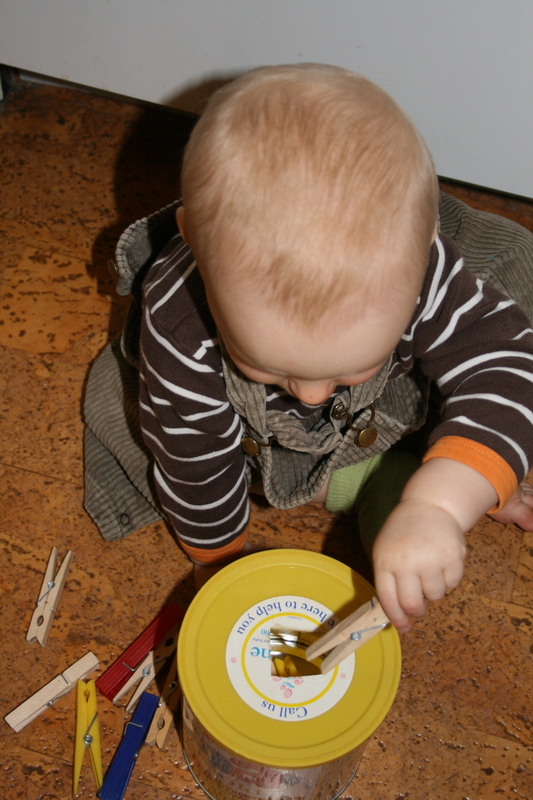 Alfie decides to play glockenspiel along to Christmas music. 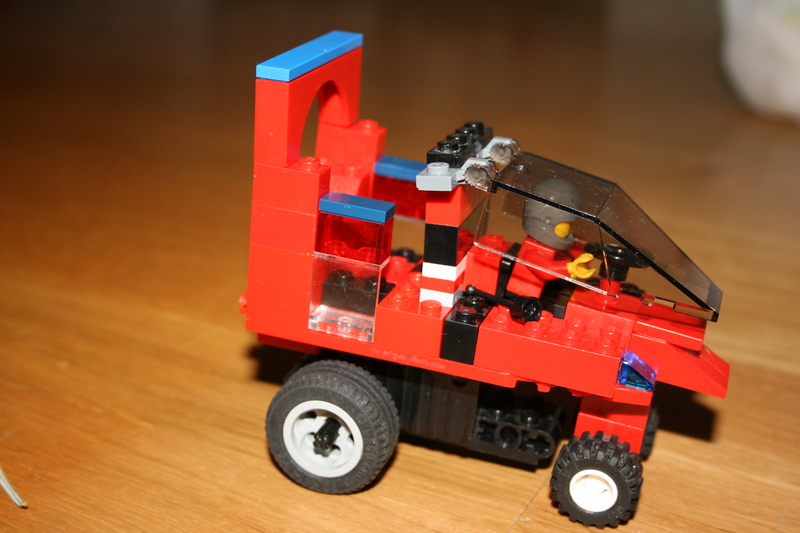 Lego is still the favorite toy in my house. Ted discovers the world of books. 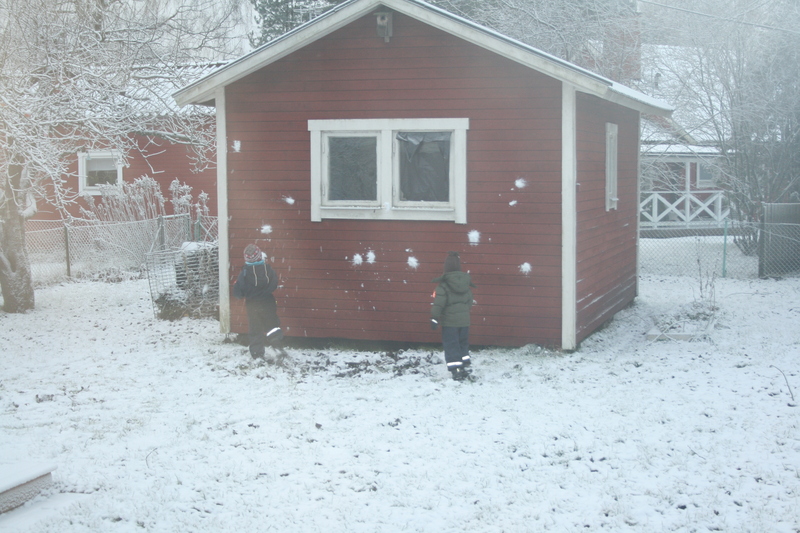 The first snowballs of the year. 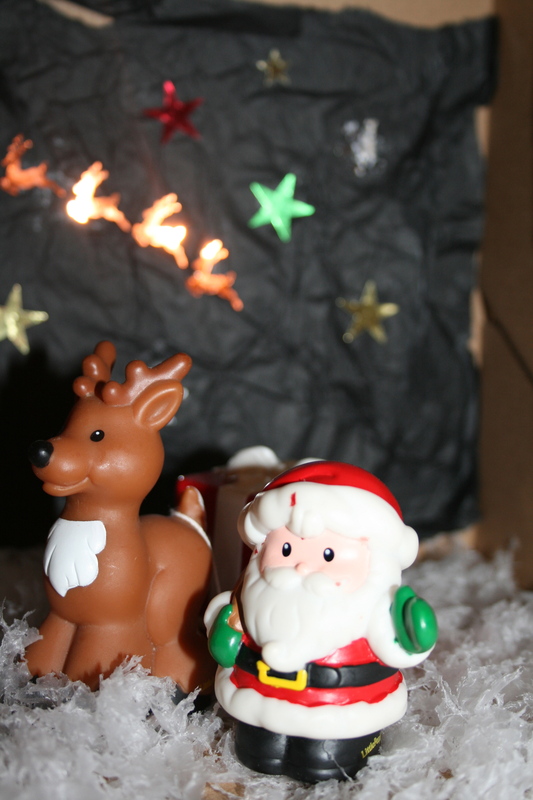 We hope you’re enjoying a busy Yuletide too?! 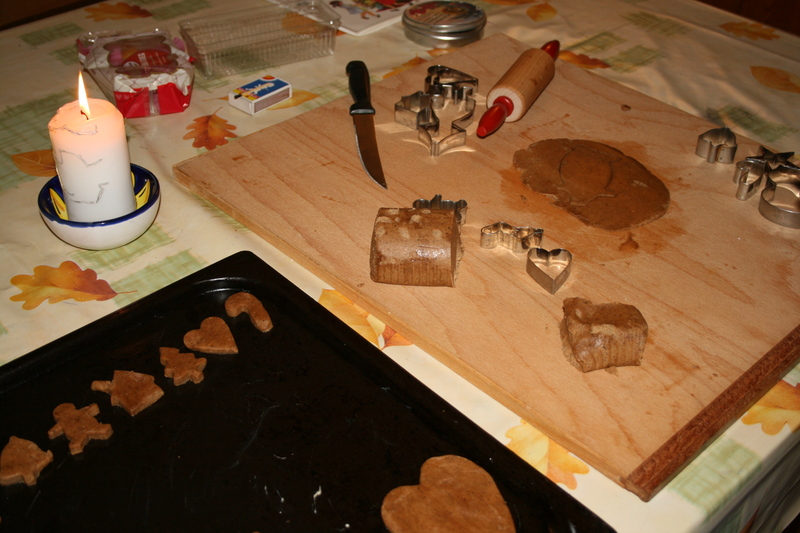 Gingerbread is a big thing in Sweden. 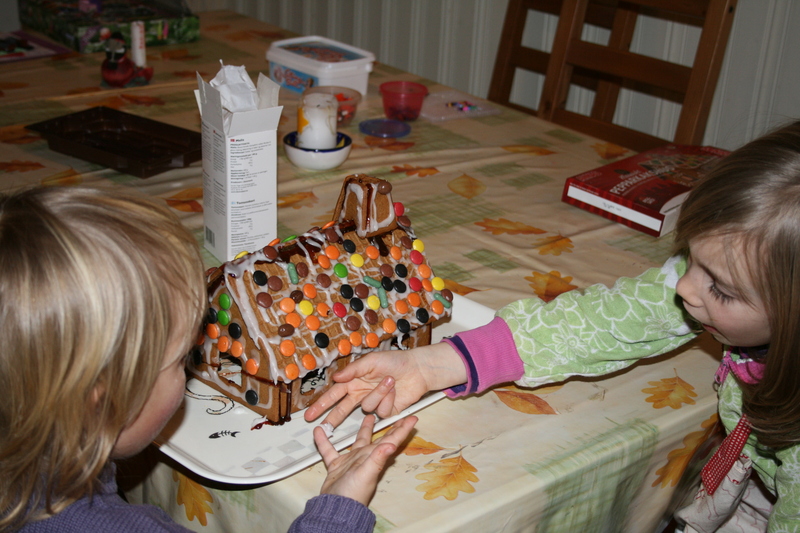 The Swedes call it ‘pepparkakor’, and it has been used in Sweden since the 13th century! 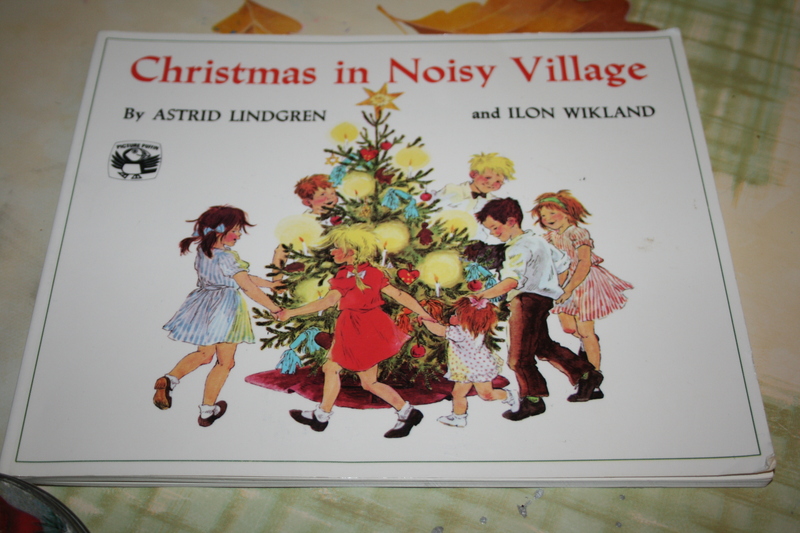 A story about a group of children enjoying an old fashioned Swedish Christmas – which of course includes making gingerbread! 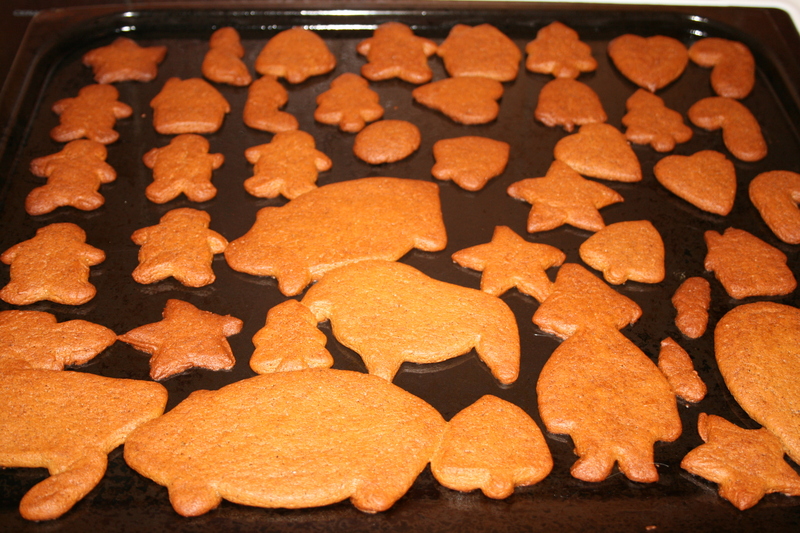 But pig or not, these ‘pepparkakor’ were very tasty…. 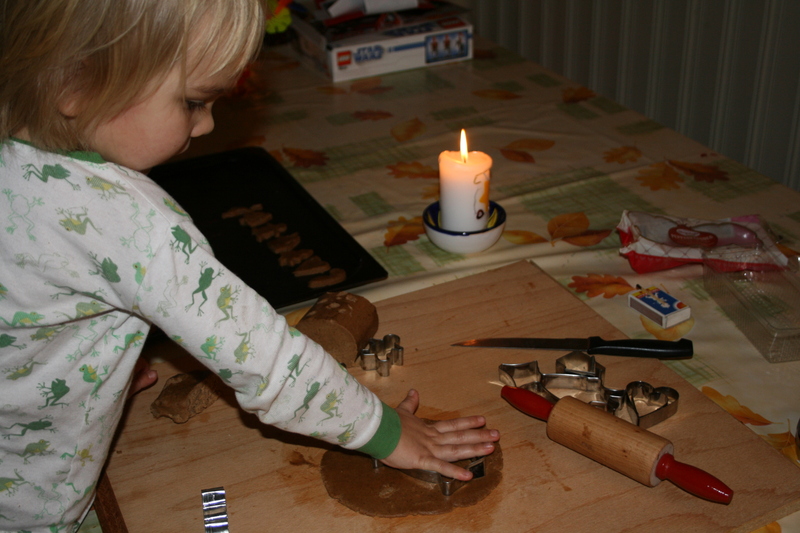 In fact, gingerbread is so popular in Sweden that they sometimes even hang the cookies from their Christmas trees as decorations, the children dress up as gingerbread men and sing a song about ‘gingerbread men in a gingerbread land’ (in Swedish only here I’m afraid) – and don’t forget to check out the annual gingerbread exhibition! 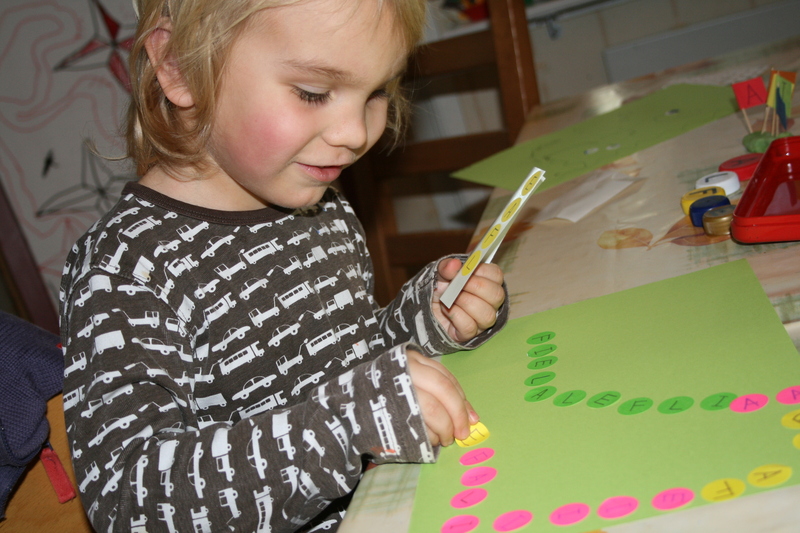 Here are photos of when we went last year….and the year before…. !